Norm Clarke has been covering the Las Vegas celebrity scene since 1999, most of it as the man-about-town columnist for the Las Vegas Review-Journal. He takes audiences on an inspirational journey. After overcoming two serious childhood setbacks months apart, Norm went on to a prominent career as an award-winning sportswriter, a Pulitzer Prize-nominated newsman for The Associated Press and one of the most-read gossip columnists in the country. 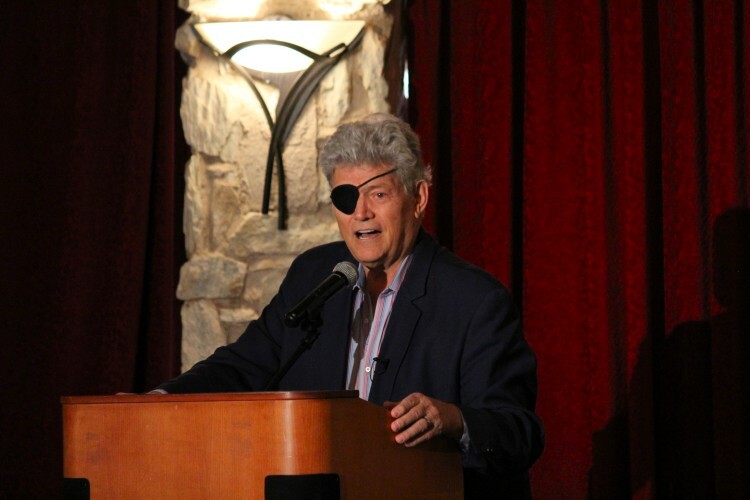 BOOK NORM CLARKE TO SPEAK AT YOUR EVENT! Now he’s winning new fans as a keynote motivational speaker. The eye-patched Montanan combines wit and insider knowledge to deliver the most entertaining and compelling stories he’s covered over the years. He flew with President Richard Nixon, had good times and tense moments with Pete Rose, and broke world exclusives on Britney Spears’ quickie Vegas marriage and Celine Dion expecting twins. Along the way, Norm experienced the life of a character straight out of a Damon Runyon Broadway play. Fittingly, the Denver Press Club honored Norm with their 2015 Damon Runyon Award. Previous honorees include Tom Brokaw, Katie Couric, Tim Russert and Ted Turner. He briefly retired in 2016 before joining the Vegas Stats & Information Network (VSIN) as a columnist to work with broadcasting legend Brent Musburger and his family. In 2013 and 2014, Norm was named Best Print Journalist by the readers in the Las Vegas Review-Journal’s Best of Las Vegas voting. Since 2012 he has been hosting “Conversations with Norm,” an interview series at the Smith Cemter for the Performing Arts featuring Las Vegas celebrities. He does a weekly entertainment segment for ABC affiliate KTNV-TV, Channel 13.